One of the main benefits of IDS office theming is how it can help you grow your business faster. IDS has themed over 300 offices and more than 30% of our clients have come back to theme a second (or third, or seventh) additional office. Theming has brought them success and allowed them to expand, adding more theming or opening additional locations. This is the story of one of those successful clients. 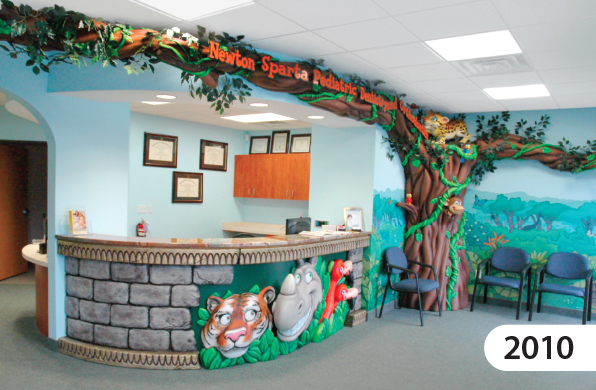 In 2010, Dr. Michael Lateiner came to IDS to add theming to the reception area in his small dental office. His goal was to create a fun space for his patients and to increase the number of patients the practice saw. 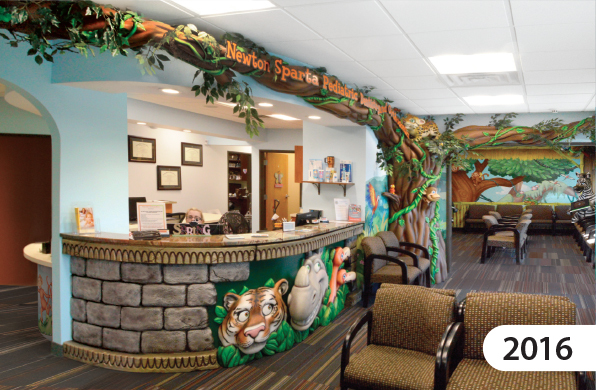 Focusing on the reception area, he began with a few murals, desk cladding, and a children’s play area. Dr. Lateiner knew his theming was a great way to connect with kids, but he didn’t yet realize its true potential; his office now had a competitive edge that was memorable, shareable, and drew in kids and parents alike. The popularity of Dr. Lateiner’s themed office grew over the next 5 years, increasing his profits and giving him the funds necessary to take over the neighboring office space. He removed the adjoining wall and expanded his treatment area and the reception (pictured above) to make room for even more patients. With a newly expanded space, Dr. Lateiner was ready for additional theming to help further grow his practice. In 2016 IDS added murals, a photo op, a themed brushing station, and even theming in the x-ray room – more than double what had been installed years before. In 2017, only a year after Dr. Lateiner’s previous project, he and his wife, Dr. Gloria Fulman, began construction on a new office. They immediately contacted IDS to plan a fully themed office. 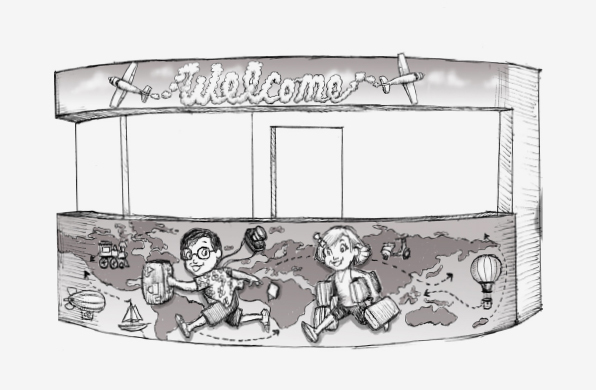 IDS created travel themed decor, featuring caricatures of a young Michael and Gloria adventuring around the world. 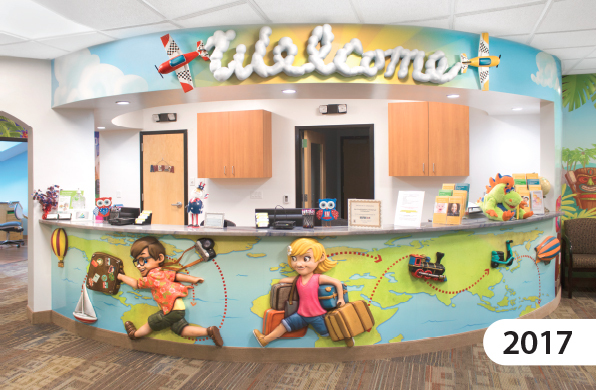 Extensive murals, photo ops, and brushing stations transformed this office into a kid-friendly environment that parents and patients love. IDS office decor will benefit your office. We see it again and again with our existing clients. Contact us to become a successful member of the IDS family too!